A pale silver-pink. Aromas of raspberries, cherries and a slight mineral essence. A lively mousse but fine in the mouth, with subtle red berry flavors enlivened by bright acids. Brisk on the palate, showing hints of oyster shell and fresh lavender. A pale silver-pink. Aromas of raspberries, cherries and a few secondary whiffs of minerality. A lively mousse but fine in the mouth, with subtle red berry flavors enlivened by bright acids. Brisk on the palate, showing hints of oyster shell and fresh lavender. Flirtatious and fun, yet elegant and structured, it’s perfect for all seasons and settings. A selection of Pinot Noir and Chardonnay from our own estate grown vineyards in Robertson, Franschhoek and Stellenbosh. Whole bunch pressing with fractional recovery from the whole bunches ensured that only the quality juice went into fermentation. Chardonnay and Pinot Noir fermented separately. Colour is obtained by an enzymatic reaction during the transport of the Pinot Noir fruit to the process. This is sufficient time for gentle colour extraction for this NV Rosé. Afte fermentation the portions are blended and then lightly fined and bottled for the secondary fermentation. This wine was given sufficient time on lees to develop subtle yeasty characters but to burst with berry and cherry flavour. Produced in the Méthode Cap Classique cellar, Robertson. From Anonymous of Johannesburg, South Africa on 6/14/2016 . Make a great gift for a special occasion. Slightly cheaper locally, but I saved the airfare for delivery to my niece's wedding. From Chabie of Columbus, Ohio on 3/18/2016 . From Anonymous of San Francisco on 1/19/2015 . From Anonymous of San Francisco, California on 12/17/2012 . 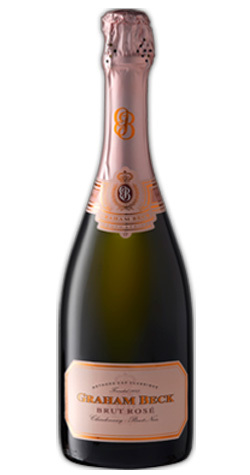 A terrific brut rose at a great price - try it.